When you receive the Travellers Cheques you must sign them immediately, in the upper left-hand corner. This is a safeguard in the event of the Travellers Cheques being lost or stolen at any time. Simply present the Travellers Cheque(s) at the bank, agent or retailer where you wish to encash it. Countersign the Travellers Cheque(s) in the presence of the Acceptor, ensuring that they see you countersign. When do I fill out the date on my Travellers Cheques? The date, in the bottom right-hand corner, should be filled out upon use of the Travellers Cheque, just like a personal cheque. Once you have dated the Travellers Cheque it will need to be used within 6 months. The Acceptor will usually allow you to re-sign the Travellers Cheque on the back, and then compare the signatures. If the Acceptor is unsure, they will call American Express to obtain authorisation. It is not American Express' policy to ask for identification when encashing Travellers Cheques. However, some countries have local legal regulations which require identification to be shown. 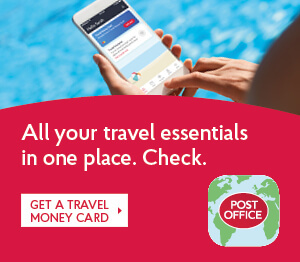 You can either hold onto them for use on your next trip, or alternatively you can take them into any Post Office or high street bureau de change outlet that offers buy-back facilities and exchange them for Sterling cash. Please note, buy back rates will differ from the sell rates. Can I use my Travellers Cheques in shops, hotels, etc? American Express Travellers Cheques can be exchanged for local currency at banks, currency exchanges and American Express Travel Service locations. Often in the USA and sometimes elsewhere, you can use your Travellers Cheques like cash to pay directly for products and services at accepting retailers, restaurants and hotels. Outside the USA, such usage is less common. Always check with the retailer first. When the full face value of the Travellers Cheque is not used, is the change returned? Yes, American Express Travellers Cheques are just like cash, but safer, so when the full face value of the Travellers Cheque is not used the change is returned as cash in the local currency. Do I need any forms of identification to encash or purchase goods with Travellers Cheques? In most cases you do not need any form of identification to encash or purchase goods with Travellers Cheques as long as your countersignature matches that given on the cheque. However, some banks and merchants may ask for a passport or photo-ID for security purposes. Is there a fee to encash Travellers Cheques at banks, agents or retailers? Commission charges may apply and can vary by country or by the encashing bank, agent or retailer. Banks apply their own encashment policy when providing encashment and exchange transactions. Do establishments accepting American Express cards automatically accept American Express Travellers Cheques? There is no direct correlation between those establishments accepting Travellers Cheques and American Express cards. American Express Travellers Cheques are widely accepted globally. What should you do to ensure that your Travellers Cheques are safe? Unlike cash, with American Express Travellers Cheques you have the assurance of the world’s most comprehensive refund and travel assistance service. When you receive your Travellers Cheques you must sign them immediately on the top left-hand line. You are not protected against loss or theft until you do so. Do not countersign your cheques until you use them, and then only in the presence of the Acceptor. Safeguard your Travellers Cheques as you would for your cash. Record the serial numbers, from the top right hand corner of your Cheques, and keep this record separate from the Travellers Cheques – this is required to identify your Cheques should you need to report them lost or stolen. Should I use Travellers Cheques instead of foreign bank note currencies, credit cards or ATMs? They can be replaced worldwide if lost or stolen. As they have insurance benefits, credit cards could be used for purchasing goods that you may want to bring back with you. Small amounts of foreign currency should also be carried to cover expenses of travelling to your destination, such as refreshments, taxis, etc. Use of credit / debit cards at ATMs allow you to obtain currency as you need it but in most cases you will incur extra charges for making a transaction abroad, for a cash advance and in some cases for use of the ATM. If I return to the UK with some unused foreign currency, what should I do with it? Unused currency can be exchanged for Sterling at Post Office branches, banks and many high street bureau de change outlets. What do I do if my Travellers Cheques are lost or stolen? For refund assistance please call the appropriate phone number as shown on your Traveller Cheque wallet at the earliest opportunity. Please have your Travellers Cheque serial numbers to hand when you call for refund assistance. Once your claim for refund is authorised, American Express Travellers Cheques will be refunded or replaced worldwide.